Raw sounding experimental lounge groove trio consisting of bass, drums and percussion. 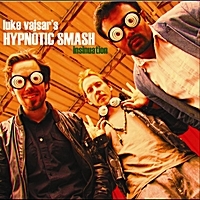 Toronto's trio HYPNOTIC SMASH consists of Luke Vajsar on bass, Andrew Vajsar on percussion and Avinash Jayakumar on the drums. The three have joined forces to create atmospheric groove music that consists of original raw bass melodies with heavy drum and percussion beats. Their sound touches experimental, lounge, blues, funk and jazz genres.